The more you want to illuminate the outdoors, the more you realize that solar lights may be a way to go, if not for the looks, at least for the lower spending. How to choose solar lamp posts? For many, looks are the most important feature on a solar lamp post. Sure enough, it’s the first thing to notice, but there has to be more to a solar lamp post in order to be good. You want a rugged build and a weatherproof construction as the solar lamp post may have to handle some difficult weather conditions. The solar panel should match the size and be large so that it charges fast. The battery should hold its charge and it should also be rechargeable, for more durability. After all, you want the solar lamp post to light up all night long. Even though most solar lights are easy to install, you should pay more attention when it comes to the solar lamp posts. You may have to attach it or weight it down so it gains stability. You want the solar lamp post not to fall on a windy or stormy day, right? Don’t forget to read the instruction! It may be that your solar lamp post needs to place in a hole and fill it around it with cement. In addition, this isn’t, for some, not that easy do to. 1). Just because you go shopping on a fixed budget, doesn’t mean you have to get back home empty handed. Sure, there may be some flaws attached to the Solar Charged LED Lamp Post Decorative Yard Light with 3 Height Options, but no solar lamp post is perfect anyway. The solar lamp post comes in fact with many good things and first thing to notice, it’s the adjustable height. You may in fact use 1, 2 or 3 post sections, obtaining three various heights: 3ft, 4ft. and 5ft. The low voltage light system include a rather large solar panel that charges efficiently the Ni-Cad batteries. The post features 6 LEDs in a frosted bulb and the light is quite bright. The light runs all night long on a full charge. The automatic light sensor eases up the operation and the solar lamp post turns on automatically at dusk and off in the morning. The build of the lamp post isn’t the worst and we notice the aluminum support with black powder coat finish. The solar lamp post looks nice on any alley and it’s protected against rust and UV. As for the installation, you may secure the base to concrete or any other flat surface as the lamp post features 3 pre-drilled mounting holes in the base. Even though it doesn’t come with a fastener/mounting hardware, you may need to use a fastener. It’s important to find the right place when installing the solar lamp post as you want the solar panel to get the best sunlight exposure all day long. The rustic charm, adjustability height and good build make the solar lamp post a nice option, especially when you check out its price tag. All in all, for a very good price, you get a rustic looking , adjustable solar lamp post that gives bright light in the night. 2). Well-made and looking great in many situations, the Paradise GL23716BK Cast-Aluminum Solar-Powered LED Streetlight-Style Outdoor Light is a reliable solar lamp post that improves any scenery. The solar lamp post is easy to put together and its build makes it long lasting. it’s made with rust-resistant cast-aluminum that takes the elements and withstands longer use. The four solar panels are large and improve the battery performances. The light runs all night, even though it dims toward the morning. The LEDs turn on automatically at dusk and stop on their own once the sun has risen. We also like the design of the solar lamp post as its traditional, with an old-fashioned feel to it. This is why the solar lamp post is a better choice when you want to decorate, and not necessarily light up for security reasons your alleys. The solar lamp post is sturdy and sits on the heavy weight side. It’s well-made and looks great. The blue hue of the light is calming, creating a nice atmposphere. Regardless, for the good build, nice style and reliable performance, you should keep this one in mind when you want to decorate the outdoors. 3). When you want your solar post lamp to only light up when motion is detected, give it a go with the XEPA SPX713 77-Inch Tall Solar-Powered LED Post Lamp with Motion Detection Function. The post lamp comes with a reliable motion sensor that has a pretty good motion, up to 10ft. The motion range is wide, up to 160-degrees. The build and the materials of the post lamp are good quality and we need to pinpoint the clear contoured glass lens and the die cast aluminum framing that is so sturdy. The LED bulbs take the long use and you don’t need to replace them anytime soon. The photo cell on the lamp turns it on automatically at dusk. The post lamp includes a switch position for two operating modes. You may use the mode “I” for the low output that may run for 18hours, whereas the “II” setting the post lamp may run for 4 hours on maximum output. It’s easy to put together the post lamp, but it’s better to place it in a zone where the solar panel can get the best sunlight exposure throughout the day. You also need to securely mount the solar post camp on a solid surface for more stability. The post lamp comes with the mounting hardware. The solar post lamp comes in several heights and models. Attractive, covering a wide area, the solar post lamp is very bright and is made with good materials. Nevertheless, for the good things that come along, the solar post lamp is one bright, attractive option to keep in mind when shopping. 4). You may feel like paying the extra buck for the Gama Sonic Pagoda Solar Lamp Post and Single Lamp LED Light Fixture, but you do end up realizing it’s worth every single penny. The solar lamp post is 87 inches tall and includes solar panels and 8 bright LEDs. The Gama Sonic’s cone reflector technology is also present, increasing the lighting. The versatility of the lamp post is great and you may manually turn it on/off using the switch, or you may rely on the automatic-on feature. In this case, the solar lamp post turns on/off on its own, according to the time of day. We also notice the two brightness levels on the lamp post so you can use the high/low brightness switch, according to your needs. The solar panels are efficient and the solar lamp post may run for even 15 hours on the low setting and 12 hours on the high mode. The 8LEDs give a maximum of 180 lumens and a bright, white light. The construction of the lamp post doesn’t disappoint either as it’s made with weatherproof cast aluminum and beveled glass. The aluminum doesn’t rust so the solar lamp post has a longer life span. The powder-coated black finish combines so nicely with the Eastern Asia design, giving you a nice, elegant solar lamp post. The solar lamp post is easy to put together and to use. It has a solid build and leaves a durability feel. It offers a nice ambient glow and is very dependable. All in all, for the special design, great build and nice light, the solar lamp post is a good investment of your money. 5). The more you’re willing to pay for your solar lamp post, the more you may expect for it in terms of performance and durability. 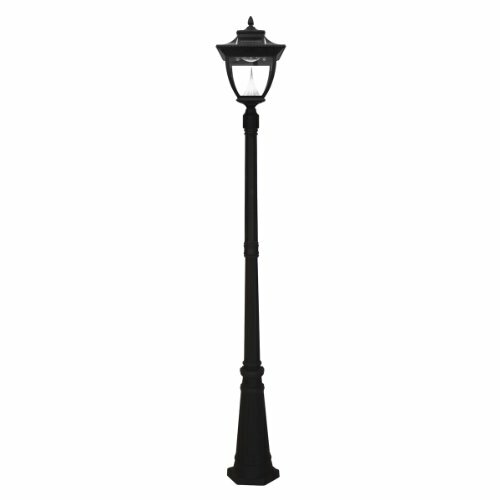 The Gama Sonic GS-94C-D Victorian Solar Lamp Post and Double Downward-Hanging 13-LED Lamp Heads doesn’t disappoint when it comes to that and may impress many. The solar lamp post is 90inches tall and comes with 5-watt built-in solar panel and 2 downward hanging lamp heads. Each of the lamp heads features 13-LEDs that give better light thanks to the Gama Sonic’s patented cone reflector. 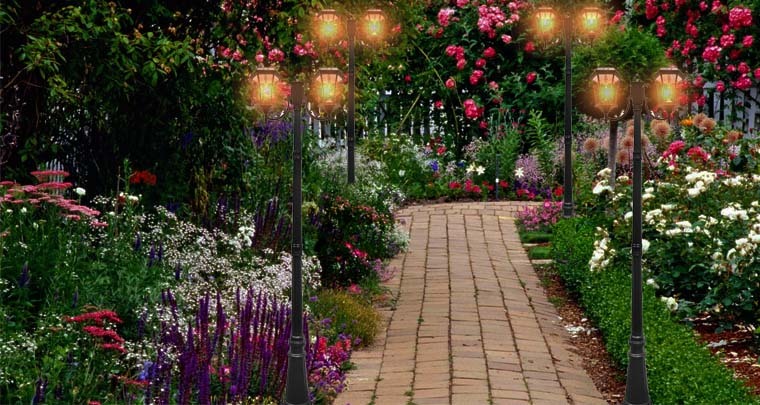 The maximum output for each lamp head is 200 lumens, so your alleys are gonna be illuminated from now on. Made for dusk-to-dawn operation, the solar lamp post turns automatically on and off. You may also turn it on/off with a manual on/off switch. Additionally, you may set the low or the high brightness switch, for more power efficiency. The construction of the solar lamp post sustains its performance and the lamp post is made with powder-coated cast aluminum that is both rust and weather resistant. Each of the lamp heads features real beveled glass panes. The solar panel is impressive also as it’s a monocrystalline silicon type. It’s protected by long lasting tempered glass that extends its life span. Important note: the glass is easy to clean for…more light. With a little patience and some skills, you may need around 30 minutes to put together the solar lamp post. 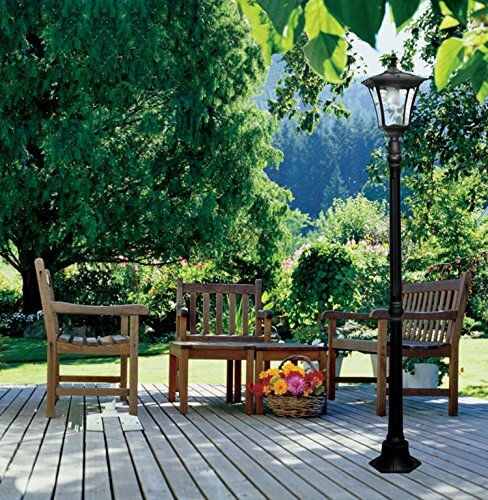 Once you’re done, the solar lamp post is sturdy and looks so elegant in any scenery. The elegant design, great build and long list of features recommend the solar lamp post as an important detail for any outdoor. In a nutshell, if you’re willing to open big your wallet, take a leap of faith and give the elegant, reliable and sturdy solar lamp post a try.